For the four years from 1931 through 1934 Edward Arthur Brandt, largely forgotten today, was one of the top left-handers in the National League. Toiling for the mediocre Boston Braves, Dutch, as he was called by his teammates, reeled off victory totals of 18, 16, 18, and 16 and was a big reason why the Braves were at or above .500 in three of those seasons, cracking the first division in 1933 and 1934. The 6-foot-1, 190-pound Brandt was anything but an overnight success and in fact was something of a reluctant big leaguer. As a youngster coming up, he suffered from an inferiority complex and homesickness that led him to jump his minor-league club on more than one occasion and head back to his comfortable surroundings of Spokane, Washington. But with the help of people like Bill McKechnie, Brandt persevered and pitched in the big leagues for 11 years. Seattle managed to get Brandt reinstated in 1926 and he appeared in four games for the Indians, going 2-0 with a 3.43 earned-run average in 21 innings. The following year, at age 22, he began to show his potential, winning 19 games against 11 losses with a 3.97 ERA in 261 innings for a third-place Seattle club. Late in the year, the Boston Braves purchased his contract for $20,000, but Brandt balked, demanding part of the purchase price. When he didn’t get it, he again jumped the club and went home to Spokane. Brandt, however, then ran into tough sledding and lost six decisions in a row to drop his record to 6-11 and raise his earned-run average to almost 5.00. A complete-game 3-1 win against the Cubs on July 25 broke the skid, but then Brandt lost six of seven to fall to 8-17. It didn’t get any better. After a 9-2 complete-game win over Brooklyn on September 5 in which he scattered 13 hits, he lost his final four starts to fall to 9-21 for his rookie campaign. His 20th loss occurred on September 21 against the Cincinnati Reds by the score of 3-2. Brandt’s final earned-run average in 1928 was 5.07 in 225⅓ innings. He completed 12 out of 32 starts and relieved six times for 38 total appearances. The Braves as a team managed only 50 wins against 103 losses to finish in seventh place, 44½ games out of first. Star second baseman Rogers Hornsby, who batted .387 to lead the league, had taken over as manager of the club in mid-May from Jack Slattery.9 Under Hornsby’s tutelage the team went 39-83. Hornsby disliked pitchers and was notoriously tough on them throughout his career; thus, one can surmise that the sensitive Brandt did not exactly flourish under the Rajah. In fact, Brandt was 4-16 after Hornsby became manager. Braves owner Emil Fuchs decided to manage the team himself in 1929 and while the team won six more games than in 1928, it sank to the basement, 43 games behind the pennant-winning Cubs. Fuchs used Brandt more sparingly, due in part to Brandt’s missing almost the month of May with an injury and to his indifferent success. For the year he won 8 while losing 13, but his earned-run average rose to an unsightly 5.53 in 167⅔ innings. Still, he managed to complete 13 of his 21 starts. Fuchs brought in future Hall of Famer Bill McKechnie to manage the club in 1930. McKechnie had a great reputation for his ability to handle pitchers, but had no early success in turning Brandt around. While the club improved to 70 wins and finished in sixth place, 22 games out of the pennant, Brandt suffered with a sore arm for much of the season and scuffled to a 4-11 record. His earned-run average (5.01) was not much improved. McKechnie used Brandt primarily as a long man out of the bullpen, but he did start 13 games, completing four. Brandt had undergone surgery for a chronic sinus condition over the winter, so whether it was McKechnie’s admonition or better health or both, he started the 1931 season like a house afire, winning his first eight starts, all complete-game victories. Although he cooled off a little once the dog days of summer arrived, Brandt still finished the season with 18 wins and 11 losses for a team that won only 64 games and finished in seventh place, 37 games out of the lead. His 2.92 earned-run average was third lowest in the league and his 23 complete games were second-most. He topped off his career year by being named to Babe Ruth’s mythical All-American baseball team12 and even finished 10th in National League MVP voting. Under McKechnie, the Braves improved to .500 and fifth place in 1932 with a 77-77 record. Brandt again was the workhorse of the staff, leading the team in wins while also finishing at .500 with a 16-16 record in 254 innings. His earned-run average jumped by a run to 3.97 and he gave up more hits, 271, than innings pitched. He completed 19 of 31 starts and tossed two shutouts. 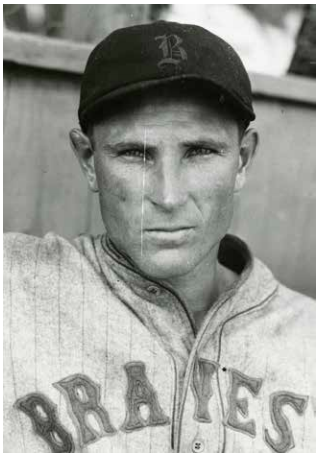 Brandt returned to his 1931 form in 1933, again posting 18 wins against 14 losses as the Braves improved to an 83-71 record to finish in the first division, only nine games behind the pennant-winning New York Giants.13 He could again claim to be, along with Carl Hubbell, one of the top two left-handers in the National League. His 2.60 earned-run average was fourth lowest in the league while his 23 complete games were the third most and his 288 innings were fourth highest. Brandt pitched in tough luck early in 1933 and his 5-3 loss to the Pirates on June 18 dropped his record to 4-8, even though his earned-run average stood at 2.77. But from there he went 14-6, benefiting from better run support as he continued to pitch well. During one stretch Brandt won six decisions in a row, including a four-hit shutout against the Cincinnati Reds on July 2. He finished the season by winning four of five starts, including another four-hit shutout of the Reds on September 19. Brandt was one of the best hitting pitchers in the National League during his career and in 1933 had his best year at the plate, batting .309 with 30 hits in 97 official at-bats. He was a good-enough hitter to be used as a pinch-hitter several times during his career, which ended with his batting average at a more than respectable .236. In 1934 Brandt had another solid year, finishing at 16-14 for a Braves team that again finished in fourth place, with a 78-73 record. He threw 20 complete games among his 28 starts, fifth most in the league, and finished with a respectable 3.53 earned-run average in 255 innings. He threw a two-hit shutout against the Cubs in May, a three-hit shutout of the Pirates in July, and whitewashed the Giants in August on another two-hitter. With nothing to lose, the Braves cleaned house after their disastrous ’35 campaign and on December 12 dealt Brandt and utilityman Randy Moore to the Brooklyn Dodgers for second baseman Tony Cuccinello, catcher Al Lopez, and pitchers Ray Benge and Bobby Reis.19 The Dodgers were entering their third season with Casey Stengel at the helm and had finished 29½ games off the lead in fifth place in 1935. The trade didn’t help much as the club slipped to seventh in 1936, 20 games under .500. Brandt was in effect the Dodgers’ number-three starter, behind Van Lingle Mungo and Fred Frankhouse, who had come over from the Braves in a separate deal. Brandt started the year slowly and after a 5-3 loss to the Cubs on July 21, saw his record fall to 3-10. But with better run support, he won eight of his final 11 decisions to finish with an 11-13 record. He threw 12 complete games in 29 starts and ended with a respectable 3.50 earned-run average in 234 innings. Brandt’s strong finish convinced the Pittsburgh Pirates to acquire him after the season in a trade for southpaw pitcher Ralph Birkofer and infielder Cookie Lavagetto. The Pirates had finished in fourth place the previous two seasons under manager Pie Traynor and were looking for pitching help to bolster a lineup that had hit a robust .286 in 1936 to tie for the league lead. It was a chance for Brandt to pitch for a contender as well as for a club that could provide run support. Brandt continued to be inconsistent in ’37 but pitched a sparkling two-hit shutout against his old team, now called the Boston Bees, on July 30 in a game the Pirates won 1-0 with a run in the bottom of the ninth.23 He similarly defeated the Reds 1-0 on September 9 in a game the Pirates also won in the bottom of the ninth on an Arky Vaughn triple and a single by Bill Brubaker. For the season, Brandt won 11 and lost 10 in 176 innings with a solid 3.11 earned-run average. He started 25 games, completed seven, and appeared eight times in relief as the Pirates finished in third place with an 86-68 record, 10 games off the pace. The 33-year-old Brandt returned to the Pirates for the 1938 season but was plagued by arm trouble early in the year and missed three weeks in late June and early July. He was used as a spot starter, with 13 starts, and in relief, with 11 appearances. Brandt was still capable of throwing a gem and shut out the Phillies 8-0 on July 19 for his second win of the year. But for the year he was inconsistent and finished 5-4 with a 3.46 earned-run average in only 96 innings for a Pirates team that was in the pennant race all year and finished in second place, only two games behind the Cubs, their hearts broken by Gabby Hartnett’s famous homer in the gloamin’. Shortly before midnight on the evening of November 2, 1944, Brandt and his fiancée were involved in a minor traffic accident as they prepared to return to Clayton from Spokane. As Brandt talked on the street to the driver of the other car, he was struck and fatally injured by another car that was traveling about 40 miles per hour.31 He was just 39 years old. Ed Brandt’s lifetime major-league record was 121 wins against 146 losses with a 3.86 earned-run average. Although he finished 25 games under .500, it is important to remember that he toiled for second-division teams for the bulk of his career and was uniformly considered a hard-luck pitcher during his playing days.32 From 1931 through 1934, he was considered one of the elite left-handers in the National League, finishing among the league leaders in innings pitched, complete games, and shutouts. During those years, he averaged 17 wins a campaign and put together a 68-55 record for Braves teams that finished no better than fourth place. Not bad for a reluctant major leaguer who for many years thought he could never succeed in Organized Baseball. The author would like to thank Greg Ivy for his genealogical research help for this biography. 1 Harry T. Brundidge, “Ed Brandt Won Belated Success After Prolonged Battle,” The Sporting News, November, 19, 1931: 7. 2 Lloyd Johnson and Miles Wolff, eds., The Encyclopedia of Minor League Baseball (Durham, North Carolina: Baseball America, Inc., 2d ed. 1997); Brundidge: 7. 3 John E. Spalding, Pacific Coast League Stars, Volume II (Manhattan, Kansas: Ag Press, 1997), 46. 4 Brundidge: 7; Tommy Holmes, “Ex-Brave Signs With Flatbush Club,” unidentified clipping dated January 24, 1936, from the Ed Brandt clippings file, National Baseball Library. 6 The Giants’ lineup featured Hall of Famers Bill Terry, Edd Roush, Freddie Lindstrom, and Travis Jackson as well as Lefty O’Doul, who many believe should be in the Hall of Fame. 7 He had also walked five in his first appearance, but also struck out five. 8 Two of the runs scored by the Pirates were unearned. 9 The 1928 Braves not only had Hornsby at second, but had future Hall of Famer George Sisler playing first base. 10 “And then suddenly the big left-hander was off to the races,” Holmes. 12 Harold “Speed” Johnson, Who’s Who in Major League Baseball (Chicago: Buxton Publishing Co., 1933), 89. 13 Ben Cantwell had his career year in 1933 and could lay claim as the ace of the Braves staff. He went 20-10 with a 2.62 earned-run average in 255 innings. By 1935 Cantwell had slipped to an unsightly 4-25 record. Cantwell’s lifetime record was 76-108, although his career earned- run average was a respectable 3.91. 14 Harold Kaese, The Boston Braves – An Informal History (New York: G.P. Putnam’s Sons, 1948), 231. 15 Al Hirshberg, The Braves – The Pick and the Shovel (Boston: Waverly House, 1948), 49-62; Mitchell Conrad Stinson, Deacon Bill McKechnie – A Baseball Biography (Jefferson, North Carolina: McFarland & Company, 2012), 154-58. 16 Gary Caruso, The Braves Encyclopedia (Philadelphia: Temple University Press, 1995), 56-57; Jonathan Weeks, Cellar Dwellers – The Worst Teams in Baseball History (Lanham, Maryland: Scarecrow Press, 2012), 91-102. 18 He did pitch in some tough luck, losing two games by 3-2 scores, one by a 2-1 count, and one 1-0 game. 19 While the trade seemed to favor the Braves, it largely involved players who seemed to be on the downside of their careers. Dan Daniel, “Brooklyn Given Brandt and Moore in Big Deal,” New York World-Telegram, December 13, 1935. 20 The Old Scout, “Pirates Aided by Acquisition of Ed Brandt,” unidentified clipping dated December 7, 1936, from the Ed Brandt clippings file, National Baseball Library. 21 Edward T. Murphy, “Brandt Closes Luckless Year with Dodgers,” unidentified clipping dated September 25, 1936, from the Ed Brandt clippings file, National Baseball Library. Hugh Mulcahy pitched all 13 innings for the Phillies. He earned his first major-league victory when Chile Gomez hit a two-run single in the top of the 13th and Mulcahy followed with a scoreless bottom half of the inning. 22 James Forr and David Proctor, Pie Traynor – A Baseball Biography (Jefferson, North Carolina: McFarland & Company, 2010), 148, 169. 23 Al Todd doubled to lead off the ninth, moved to third on a bunt hit by Pep Young, and scored on a fly ball by Red Lucas to end the game. 24 Unidentified clipping dated October 7, 1937, from the Ed Brandt clippings file, National Baseball Library. 25 Brandt was released even though it left the Pirates with only one left-handed pitcher, rookie Ken Heintzelman. “Pirates Release Brandt, Veteran,” unidentified clipping dated March 23, 1939, from the Ed Brandt clippings file, National Baseball Library. Traynor reportedly sat in the hotel lobby until 3 A.M. waiting for Brandt and teammate Russ Bauers to come in for the evening before giving up and going to bed. Forr and Proctor, 173-74. 26 Unidentified clipping dated March 28, 1939, from the Ed Brandt clippings file, National Baseball Library. 27 “Hollywood Club Releases Ed Brandt,” unidentified clipping dated May 3, 1939, from the Ed Brandt clippings file, National Baseball Library. 28 Unidentified clipping dated January 21, 1943, from the Ed Brandt clippings file, National Baseball Library. 29 “Crash Fatal to ‘Lefty’ Brandt,” Spokane Spokesman-Review, November 3, 1944: 15. 30 Unidentified clipping dated August 31, 1944, from the Ed Brandt clippings file, National Baseball Library. 31 Brandt was struck by a car driven by First Lieutenant Louis Sanchez, who was convalescing at the Fort Wright Hospital from battle fatigue after more than 50 missions over Germany as a bombardier. He had won the Air Medal and Distinguished Flying Cross and may have been suffering from what we would now call post traumatic stress syndrome. On the night of the accident Sanchez was being followed by a patrol car because of his speeding and erratic driving. No alcohol was involved, however. “Question Raised in Brandt Death,” Spokane Spokesman-Review, November 3, 1944: 14. 32 Murphy, “Brandt Closes Luckless Year with Dodgers”; The Old Scout, “Pirates Aided by Acquisition of Ed Brandt” (“For eight years the husky left-hander has been tossing ’em in for light scoring teams.”); Letter to the Editor of The Sporting News from J. Roberson dated June 1, 1933, from the Ed Brandt clippings file, National Baseball Library (Ed Brandt is “the greatest pitcher in the National League” and “the champion hard luck pitcher in the game today,” and would win 25 games with a better-hitting team).